I hate to say I called it when the commercial came on, but I totally did. I didn’t watch much of the Super Bowl except for the stellar halftime show and a few commercials, but this one Coca-Cola ad I did watch. It featured a rendition of “America the Beautiful” sung in different languages. As the commercial went on, a crazy thought came into my head: “I bet you some racist assholes are going to complain about the fact that this American song is being sung in different languages.” My exact thought wasn’t so eloquent, but turns out it wasn’t such a crazy thought after all. Deadspin has compiled a list of idiots people who indeed did complain via Twitter because of the diversity displayed in the commercial. The list, unfortunately, goes on and on. Yes, this song is an American classic. Yes, we’ve grown up listening to it in English. 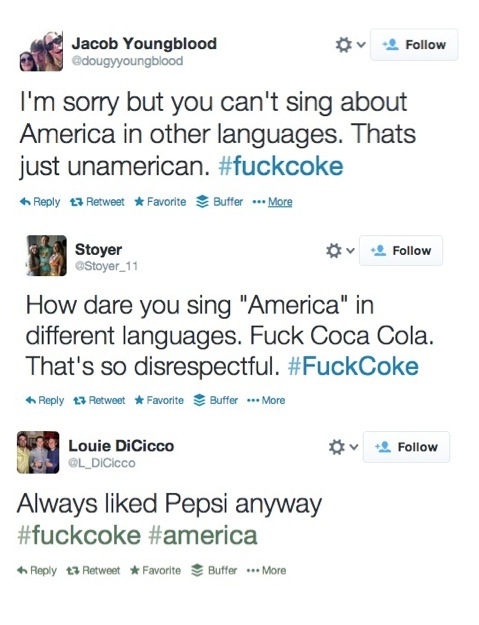 No, it does not give you the right to be stupid and complain that Coca-Cola was trying to do something beautiful and showcase the diversity of this nation. People have been saying that they are no longer drinking Coke after this. Well, I should be staying away from soda in general, but when I do have it, I’ll be drinking my Coke with a little bit more happiness. I think what Coca-Cola did with this commercial was great, and I definitely support it. Check out some of the dumb tweets over on Deadspin. If you can bear to stand the stupidity. This entry was posted in TV, Video, YouTube and tagged america the beautiful, Coca Cola, Coke, commercial, super bowl. Bookmark the permalink.